The importance of Functional Magnetic Resonance Imaging (fMRI) is growing rapidly in both clinical and academic settings. Resonance Technology understands the need for a simple yet comprehensive solution to perform all aspects of fMRI both clinical and research. 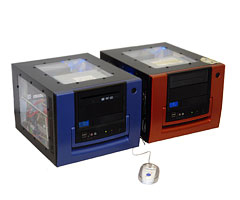 Filling this need, fMRI is an innovative turnkey fMRI processing solution perfect for both new or experienced users. Easy patient instruction and preparation. Real-time task presentation of any audio, video, or tactile paradigm. Fault tolerant (RAID) image archiving (fMRI-PACS). Automatic image handling and SPMR processing. Online result review (fMRI report). Control of task presentation using Resonance Technology VisuaStim, CinemaVision and SereneSound. funcLAB easily integrates into your clinical workflow, making fMRI similar to a standard MRI procedure. No time-consuming data analysis is required - funcLAB does the job while you take care of your patients. When you are ready, funcLAB provides you with a comprehensive fMRI case report. Results are online and can be shared easily with colleagues or attached to patient file, PACS entry, or email. 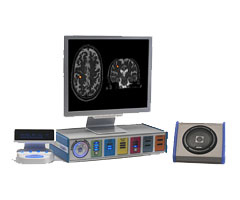 funcLAB is designed to work hand-in-hand with Resonance Technology's visuaStim, an advanced task presentation module providing the most sophisticated immersed environment available for fMRI brain stimulation. Together, they provide a full-featured automated, turnkey fMRI solution that sets new standards in ease of use and enables any radiologist to perform state-of-the-art fMRI exams. Expanding your fMRI task portfolio is easy with funcLAB. Just add experiments from the online library or create your own designs. Use the automatic or interactive analysis with SPMR (www.fil.ion.ucl.ac.uk/spm), the most cited Neuroscience tool for fMRI, and expand your fMRI experience in one of the many SPM courses.